The half-wall comes with support rail and clamps. These walls are designed to allow access in and out of your marquee. The door fabric rolls up when needed to stay open and can be zipped closed. The window wall has a mesh window to allow air and light to flow into your Easyshade marquee. Use mesh walls in conjunction with plain or zipper door walls. These walls are perfect for hot summer days and in the event of rain all you have to do is undo the outside solid wall flap which then zips securely. Made from durable polyester fabric. Easy to secure to roof top with full length Velcro strip on top of wall, Velcro ties on sides to attach to legs. 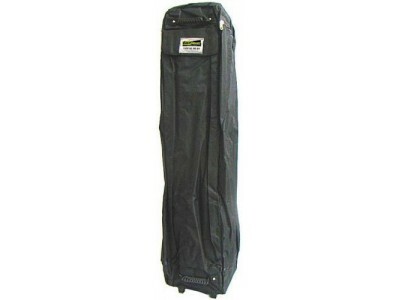 Heavy Duty Commercial Grade Polyester Carry Bag with wheels. Pockets for canopy, ropes and pegs. Zips top and bottom for easy access. The weight simply slides around the hexagon leg and sits over the foot plate. Each bag holds approximately 8kg of sand.